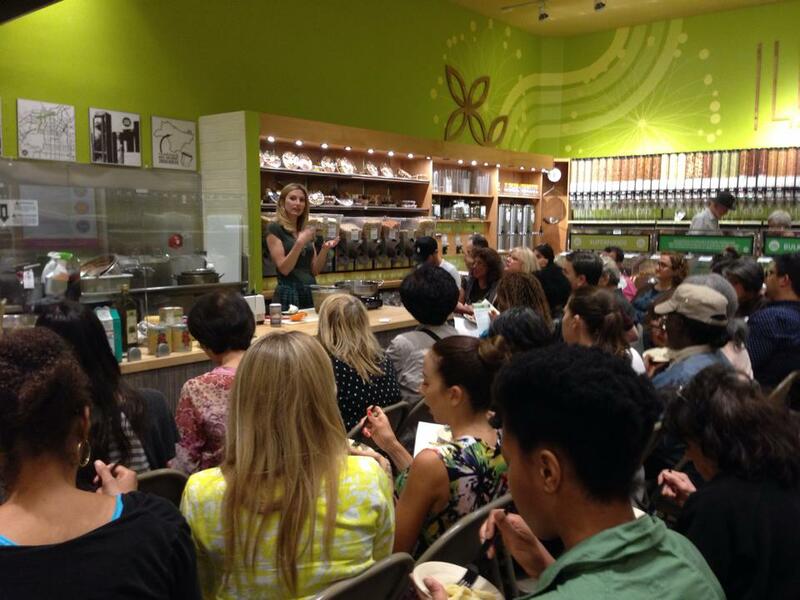 Last night I taught another successful class at Whole Foods at 3rd and Fairfax in Hollywood and there were so many people that weren’t able to get reservations, so I thought I’d share the recipes here 🙂 This cooking presentation was all about Italian sauces. My vegan Springtime Pesto, Cauliflower Alfredo, and Spicy Marinara. The base of these 3 sauces are what I call the Italian Mother Sauces. You can use them and combine them to make just about any kind of Italian food. So enjoy the recipes and let me know how you like them! Make sure you check my appearances page to find out about my next classes and festivals! You’ll place the basil and spinach in the food processor topped with the garlic and nuts. Pulse a few times to break them down a bit. Add in the zest from the lemon and all the lemon juice. Pulse again and then drizzle in the olive oil until the pesto is smooth. Cook your pasta to al dente, drain and return to the pot. Add the pesto right on top and stir to coat the noodles. Serve immediately. When both are done, using a slotted spoon, remove all the cauliflower from the broth and place in a blender or food processor. Add 1 cup of the cooking broth, all the contents of the frying pan, the nutmeg and salt. Puree on high until very smooth, 3-4 minutes. Add a little more broth at a time if it needs to be thinned. Add pepper to taste. In a large frying pan over medium heat, saute the onion in some olive oil and a pinch of salt until soft. Add in the cans of tomatoes, stir and let simmer for about 10 minutes. Using a wooden spoon break up the tomatoes. Add the garlic and simmer another few minutes. Stir in the basil and serve over pasta, polenta, quinoa, etc. The recipe for the tomato sauce lists 2 (28oz) cans of tomatoes. But the recipe directions indicate you only use 1 can, can you clarify? Hi Stephanie! Sorry I forgot the “s” 🙂 Fixed it! I hope you enjoy!